2. Pull the bridle lines out from underneath the kite and separate them neatly. 3. Walk the bar and lines directly into the wind. Separate the lines and connect them to the bridle lines. Keep in mind that they are color coded. 4. Take both kite lines on the right side of the kite and pull them underneath the kite, to the left side of the kite. This will prevent the lines from tangling while you launch the kite. 5. You can place a bit of sand on the far right side of the kite if the wind is blowing strongly. 6. Pull the right side of the kite slightly into the wind so that the wing-tip catches a bit of wind. 7. Walk to your bar and connect the bar to your harness. 8. 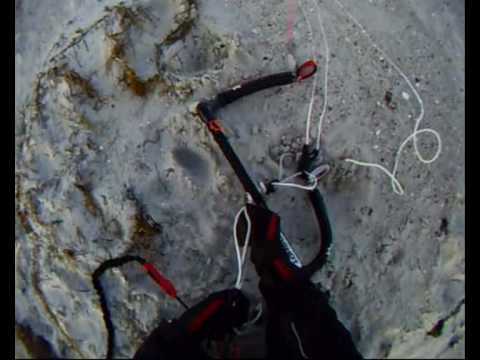 Connect your safety leash to the kite bar. 11. Once the kite has flipped up, let go of the line and take control of the bar and launch the kite. 12. You can also stand at a 45 degree angle to launch the kite safely – it all depends on the speed of the wind and the location. Let go of the bar if you feel overpowered by the kite. The kite will stop pulling you but will continue to go up.